2 What is a Regulatory Disorder in an Adult? 2 What Can Go Wrong? 1 What is Obsessive–Compulsive Disorder? 2 Is There a Difference Between Healthy Rituals and Obsessive–Compulsive Behavior? 3 What Causes Obsessive–Compulsive Disorder? 4 How Can Obsessive–Compulsive Disorder Be Treated? 1 What is Sensory Integration? 1. What are You Doing that is Ineffective that You Want to Change? People experiencing disorders in regulation are highly sensitive to stimulation from the environment, emotionally reactive, and have difficulty maintaining an organized and calm life style. They are impulsive, easily frustrated, and as a result make decisions that lead to an overwrought state-or who conversely retreat entirely from the world. This disorder is most likely to accompany diagnoses of bipolar or mood disorder, anxiety, depression, obsessive-compulsive disorder, Asperger’s syndrome, eating or sleep disorders, and/or attention deficit disorder. 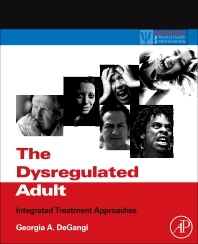 This book instructs therapists how best to treat the dysregulated adult, providing diagnostic checklists, and a chapter by chapter inventory in approaching treatment of dysregulation in a variety of life skills.